One of the facial sunscreens I tested while I was away in Turkey was the Origins A Perfect World SPF 35. Naturally I gravitated towards my favourite skincare brand's sun care range. I don't like tanning too much on my face at all, It dries my skin out way too much and having a burnt face one of the worst things to get when you are on holiday! In the UK I dont wear a separate SPF as most of the foundations I wear SPF35 is fine for my face as I have skin that luckily doesn't burn very easily, but maybe look into higher SPF if your fairer than me or burn easily. The one plus point from my strange skin tone is the fact it tans well and doesn't burn easily! 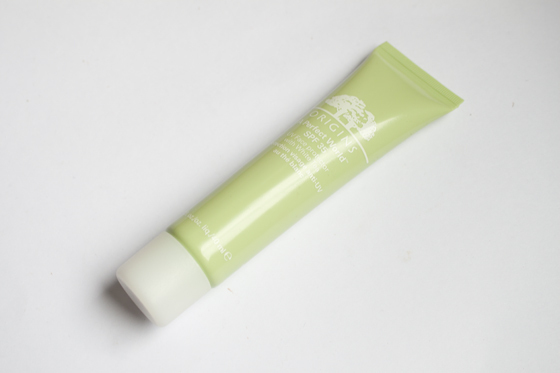 Origins A Perfect World SPF35 is described as a UV Face protector which contains White Tea and Maritime Pine. White tea is great for protecting the skin from environmental damage and delay visible signs of ageing. This would be a great SPF for city holidays because it's has alot of skincare benefits that stop the environmental damage. The sunscreen has a very "Origins scent" to it, if you've ever tried Origins you'd know what I mean. It's a sort of fruity and fresh scent that has a light citrus-y smell. The sunscreen sinks into the face easily without leaving much greasy residue. My skin doesn't feel over saturated or slick, it's not mattifying so it leaves a slight dewy look but nothing compared to the way some suncreams leave my face feeling. I really enjoyed using this, it's slightly tinted so it evening out my skin tone a bit as well as having a touch of sun protection! Sunscreen Disclaimer: I have olive toned skin that tans really well and I very rarely burn. I typically use SPF 15 to SPF 30. Always use the appropriate sun protection for YOUR skin and be conscious about applying it throughout the day.